Over the last several years, two equipment-heavy stereotypes have formed out of the ether and the Internet: the DIYer and the geek. The stereotypical geek comes armed with soldering irons, sci-fi shows on DVD, and encyclopedic knowledge of multiple branches of science, while DIY enthusiasts carry glue guns, a lot of yarn, and books about reinventing t-shirts. They may seem diametrically opposed, but closer examination of the two reveals an overlap that contains both crafty geekery and deeply nerdy art. Amigurumi is a popular subset of the fiber arts, wherein cute things (usually animals, but sometimes inanimate objects) are rendered in knitting or crochet and stuffed. 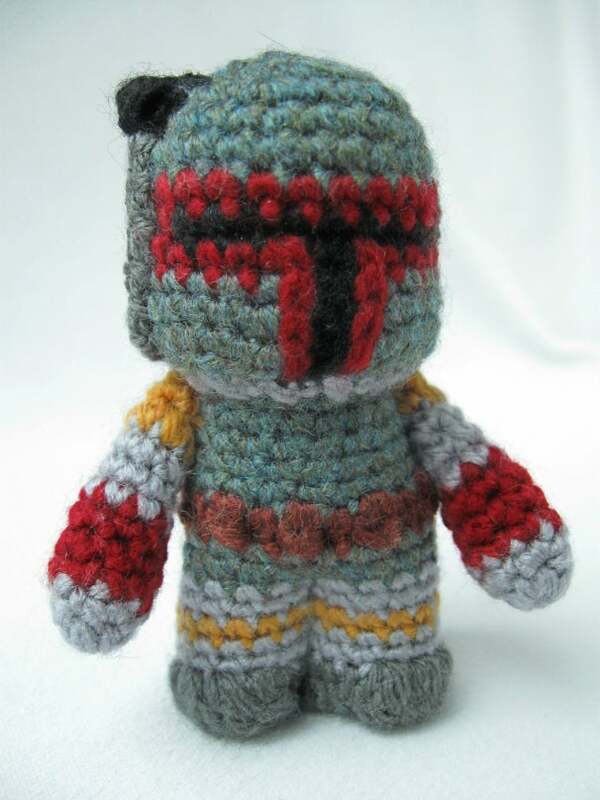 The amigurumi world didn't know what it was missing until this 3.5-inch Boba Fett came along, created by Flickr user Angry Angel/Etsy shop owner Lucy Ravenscar. She sells crochet patterns for a wide variety of Star Wars denizens, including Darth Vader, C-3PO, and ewoks (it seems she specializes in Wicket). My Little Pony, in addition to entertaining millions of five-year-old girls (and, with the Lauren Faust cartoon reboot, a growing contingent of 18-to-35-year-old guys), also provides many artists with adorable pony-shaped canvases ripe for customization. Inspired by Battlestar Galactica, DeviantArt user Spippo created My Little Starbuck. Colorwork in knitting stereotypically takes the form of snowflakes, Nordic stars, and simple geometric shapes. A growing contingent of geeky knitters, however, would rather their blankets and sweaters be emblazoned with more current--or time-traveling--fare. This TARDIS blanket, made by Carrie Fritsche, is both available as a free pattern and is warmer on the inside. 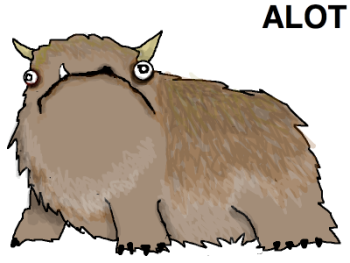 Allie Brosh of hyperboleandahalf enthralled the grammar sticklers of the Internet with her April 2010 post on the habits and characteristics of the alot, a creature that resembles a mix between a bear, a yak, and a pug. 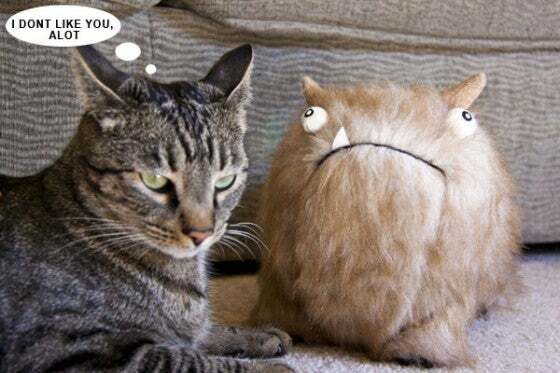 When faced with a phrase containing the grammatical error “alot”, Allie re-imagines the sentence as could be applied to a big furry squash-faced animal. The artists and crafters of the Internet went wild, up to the making of a (sadly, infrequently-updated) website ilikethatalot.com, which collects various versions of the grammar animal. This awesome watercolor, created by redditor MoonMonstar, received enthusiastic support from Allie, who happens to be a redditor herself. In the three-dimensional realm of the crafting world, Alix Banegas of arixystix creations rendered the alot in plush. Then, true to the conventions of the Internet, she posed him with her cat. Many craft forms are surprisingly digital in execution, which means much of their planning is facilitated by judicious applications of graph paper. Knitting and quilting patterns often resemble a very geometric form of color-by-numbers. The pattern for this Fiery Phoenix quilt, created by instructables user, was created using Microsoft Excel, with support from MATLAB to make sure the flame effect was properly randomized. Knitting machines are catching on in installation art: the clock that knits a scarf makes a point about creative potential, while a wind-powered model allows Mother Nature to express her crafty side. The Interactive Knitting Machine (above) displayed at Dev Camp 2010, however, takes the robot-knitter to the next level. Powered by viewers' breaths, the machine dyes yarn in a pattern determined by the strength of the blow and the specific straw blown into, and then knits the yarn into a collaboratively-knitted piece with a colorful signature from each of many, many co-creators. The stage curtain at the Oslo Opera House may look like it's been Photoshopped, but it's actually a piece of textile art made by Pae White called “Metafoil”, is as real as its component cotton, wool, and polyester fibers. Created by a computer-controlled loom from a scanned image of crumpled aluminum foil, the enormous curtain knocks viewers off balance, reminding them not to take superficial images for granted and always take a closer look. Nerds the world over have succumbed to the soothing radiance of UV-reactive substances of all varieties. But while fluorescent paints and dyes make wearable glow possible, they also use a great deal of water, chemicals, and labor to obtain results. A new development by the Institute of Materials Research and Engineering in Singapore could render the conventional dye process obsolete: dyes, colorants and other materials, when fed to silkworms in the last four days of the larval stage, become integrated into the worms' silk cocoons. The technique could potentially be used to introduce many other compounds and properties into silk, creating a wide variety of functional fabrics. So it’s not just about the surprising stuffed toys or using tech to generate textiles - that intersection between craft and geek leads to fascinating applications of both art and science. How have you applied non-standard nerd knowledge to your geeky endeavors? Answer in the comments!